Poly-Snaps: Tiles for Building Polyhedra by mathgrrl is licensed under the Creative Commons - Attribution - Non-Commercial - Share Alike license. These tiles snap together to make polyhedra of any type you wish! Regular, semi-regular, truncated, stellated, or freaky; you decide. 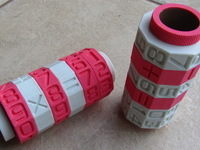 Customize your own with the "Open in Customizer" button or download pre-made sets of compact or light Poly-Snap tiles. The compact tiles are the blue, white, and black ones in the main picture; they are sturdy and difficult to snap together, so they make very strong models you can toss around. The light tiles are larger and shown in the red picture; these are easier to take apart and put together and print up very quickly, but the models are a little less sturdy. 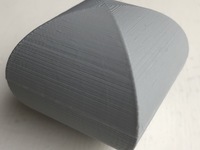 Depending on your printer and the filament, temperature, elevation from sea level, day of the week, etc, you may need different tolerances for your snaps; you can modify this in the Customizer. A few technical notes and tips are listed in the Instructions tab. 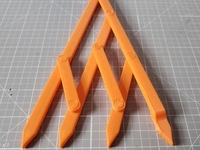 Detailed walkthroughs of how we used OpenSCAD to make Poly-Snaps to construct particular models are at the links below. Unlike the tiles we used in http://www.thingiverse.com/thing:185859, these Poly-Snap tiles all have identical snap configurations. As long as you are trying to build an orientable surface this one configuration will suffice. The only trick is to make sure you don't attach them in the wrong orientation. On a Replicator 2 the Poly-Snaps print with a shiny side and a matte side; keep one type of finish on the inside of the model and one on the outside, and all your tiles will line up correctly. You may have to snap and un-snap the tiles a few times to break them in; they get a bit looser over time. A pair of pliers can help snap them together the first time, if needed. We suggest making the border size close to the thickness. Because of the way this model was constructed, you can't make completely solid tiles, and because of reality you can't have the border be larger than the radius, so make sure your border is small enough to fit within the tile. In our experience, clearance works well between .1 and .2, and lengthen works well between .3 and 1.2.